So you want to become a scuba diver! Welcome to the best club ever! We are so excited you want to join us and hundreds of thousands of other divers in this underwater world! But where do you start? Are you on a budget or have you got some money to splash? Based on our member's recommendations within our Facebook group we list the countries you can get certified in from the cheapest to the most expensive. Where will you choose to do your Open Water Course? 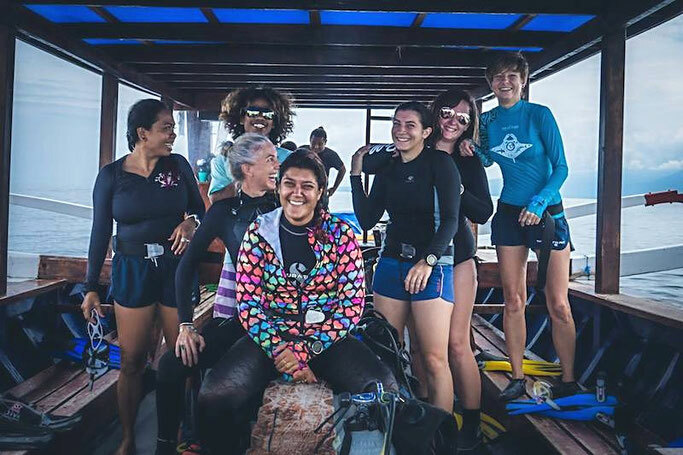 *Please note, the price shouldn't be the reason you make your decision, think about the quality, safety, the standard of equipment and professionalism of the dive centre and the staff first and foremost. We cannot stress this enough, you are about to learn how to survive in an environment (water) humans can't survive in without specialised equipment. Your safety is your number one concern. - Is it in a pool? ocean? lake? - Accommodations while you are completing your course? How much is that? - How many people will be in your class? How much one-to-one-attention will you get? A class of up to 10 students offered on weeknights and weekend days at Bottoms up Scuba. The textbook is yours to keep, and a video is to be loaned to you. If you want to keep a video for future reference, you can purchase one for an additional charge. This option is home study, and you must complete all videos and textbook knowledge reviews before class. Includes: Everything! All gear rental, pool session, and certification card. $260 for an individual or $230 for 2 or more people at Red Sea Relax in Dahab, Egypt. Each course has a maximum of 4 people and free dorm accommodation is included. Bonus; Dahab is very cheap for foreigners, so food and activities won't put you back too much either! Utila is world-famous is the scuba industry for being one of the cheapest "all in" places to get certified. At Underwater Vision their Open Water course includes EVERYTHING as well as accommodation. So that $299 is all you will be spending. The island is a pretty awesome place too! Notorious known as one of the cheapest places to do your Open Water in the world, it seems Koh Tao in Thailand has been beaten in the last few years. However, that island life is tempting, and while doing your course you'll also be living the dream. Crystal dive offer Open Water for $310. A hop over from the USA to Micronesia will land you in Guam - unincorporated and organized territory of the United States but much cheaper in all aspects. Get your Open Water course at Amt Guam for $350 - take a look on their website to see what it includes. Bonaire, with its fringing reef in close proximity to the shore, about 80 official dive sites, calm waters and good visibility has something to offer for every diver. And when a course will only set you back $375 it's a win win all round! Check out Buddy Dive for more info on what's included. We love Gili T in Indonesia, we've been so many times because the quality of the instructors over there are brilliant. At Manta Dive their Open Water course is just $395 and a good time full of knowledge is guaranteed. You'll most likely see some of the GTS team over there at most points in the year too, and shh.. they offer GTS discount card holders an extra 10% off! While the water may not be the warmest, what you can see under there is nothing short of amazing! A visit to South Africa would be complete with your first scuba diving course! Talk to Dive School Cape Town for more info! Found yourself in Europe? That doesn't mean diving is off the cards, in Belgium you can get a really reasonable priced Open Water course at The Diving Centre. The U.K has some amazing dive sites which we've talked about a lot here and doing your Open Water course in England is a lot of fun! There's plenty of places to chose from starting at around £375 ($510) at Aquanauts in Plymouth. Diving on the Red Sea is the dream! The clear water, coral and marine life, and the life that goes on above the water too. We really love Jordan and how many things there are to do there that it makes complete sense to try scuba diving in Aqaba when you are there too. Our good friend and instructor Omar Madain offers private courses starting at $520. And if you tell him Girls that Scuba sent you he may even give you a little discount! Can you afford to scuba dive in Maldives? We did! You can check out more about how you can dive on a budget in the Maldives here, and you can head over to Fulidhoo Dive to get your Open Water for under $600! We all want to dive in the Bahamas right!? And we think the price tag may even be worth it for the beauty that you'll be seeing. If you find yourself over in paradise give Scuba Dive Bahamas a shout and get more information on doing your Open Water course! 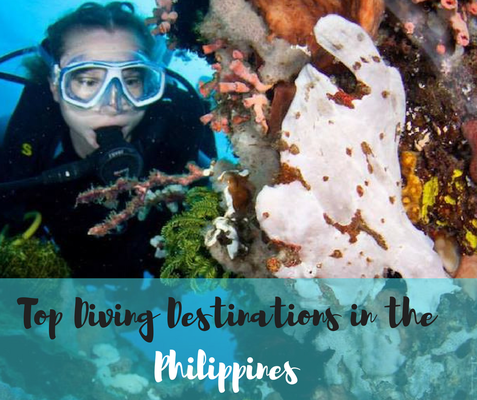 Want to save EVEN more on diving? 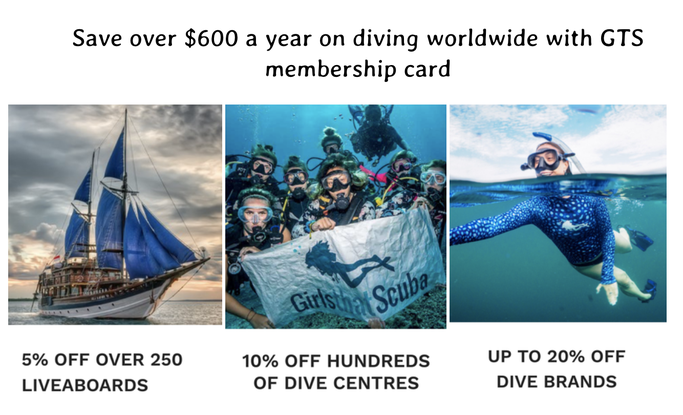 Snap up our GTS discount card giving you 10% of diving in hundreds of dive centres around the world, as well as liveaboards, brands, equipment and more!